I’ll be honest—I have difficulty making good pancakes. I chalk it up to not doing it that often, partially (well, mostly) due to my aversion to breakfast foods. Plus if I have to eat something breakfasty, I prefer French toast most days and Josh does make an awesome French toast casserole. 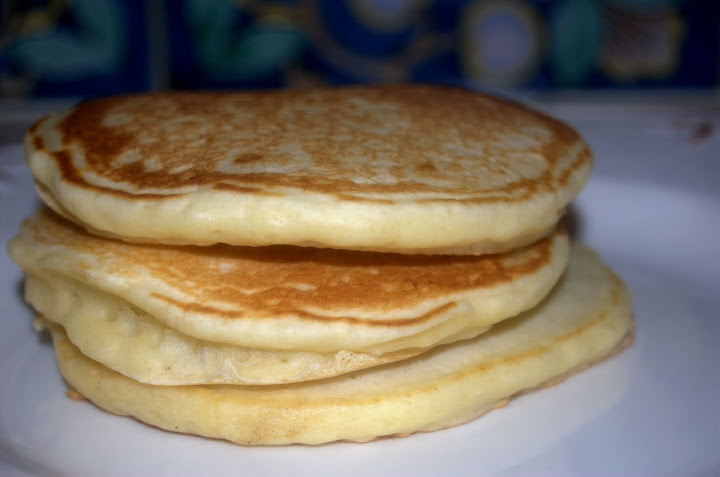 I used to be good at pancakes….when I was ten….and we bought boxed mix. Because let’s face it–those boxed mixes have the chemistry down; that’s because they spend millions of dollars on research and design. But making pancakes from scratch was never my forté. But Josh likes pancakes. And I imagine I should learn to try to like breakfast foods more—at the very least, to make it less awkward when going out to eat and everyone else is ordering bacon, eggs, french toast and bagels and I’m ordering chicken caesar salad. Yeah, I’ve done that. At Angelos. You can get the chicken caesar there anytime. Also, I often get deli chicken salad and bread at Amer’s or Cafe Zola. But anyway—we’re talking about breakfasty foods here. So in an effort to be a more “breakfasty” person, I decide that what I need to do is just jump feet first into the syrupy pool of carbs and starches that everyone else seems to know and love. First, however, I need to master the basic pancake. You know, sweet, fluffy, light, nicely browned. Not too doughy, not too flat. Pancakes. You know, pancakes. So I went online and found a pretty basic recipe from the Joy of Baking, which is a good source for information and tips. I got out my electric griddle–you can use a stovetop one, or a big skillet, whatever. And then I just followed directions, more or less. I will say that I sifted all the dry ingredients first, and that after mixing everything together, my batter seemed a bit…thick…so I added a bit more milk until it reached a consistency that seemed more normal to me. And I did not overstir. How did it come out? Really pretty good, actually. Simple, easy, fast. I stored finished cakes in the oven, set at 200F, until the next batch was done, to keep them hot. I served a couple slices of fried Black Forest ham on the side and topped them off with real maple syrup–the good stuff. Josh was suitably impressed. Me? I have reached a mini-milestone of accomplishment. Next week? Upping the ante with cinnamon sugar pancakes. I don’t have a recipe for that yet, but I’m going to make on up on my own. Stay tuned…. In a large bowl whisk together the flour, baking powder, salt and sugar. In a separate bowl whisk together the egg, milk, and melted butter. Add the egg mixture to the flour mixture, all at once, and stir or whisk just until combined. The batter should have some small lumps. Make sure you do not over mix the batter or the pancakes will be tough. Heat a frying pan or griddle over medium high heat until a few sprinkles of water dropped on the pan or griddle splatter. Using a pastry brush, brush the pan with a little melted butter.Using a small ladle or scoop, pour about 1/4 cup of pancake batter onto the pan, spacing the pancakes a few inches from each other. 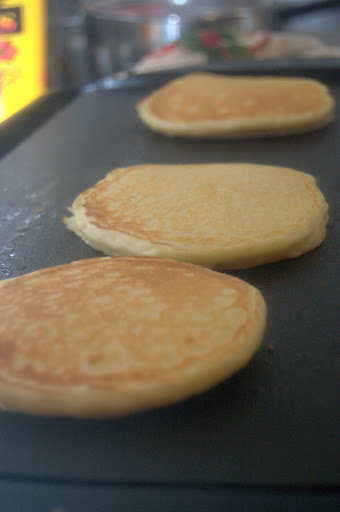 When the bottoms of the pancakes are brown and bubbles start to appear on the top surfaces of the pancakes (2-3 minutes), turn over. Cook until lightly browned (about 1-2 minutes).Repeat with remaining batter, brushing the pan with melted butter between batches. Serve immediately with butter and maple syrup. 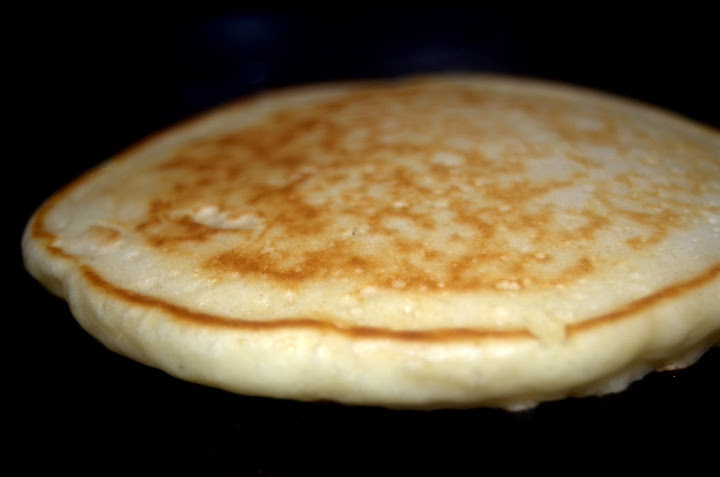 Makes about 8 – 3-inch (7.5 cm) pancakes. Serves 3-4 people. For Blueberry Pancakes: Sprinkle fresh blueberries on the tops of the pancakes just as bubbles start to appear on the top surface of the frying batter. 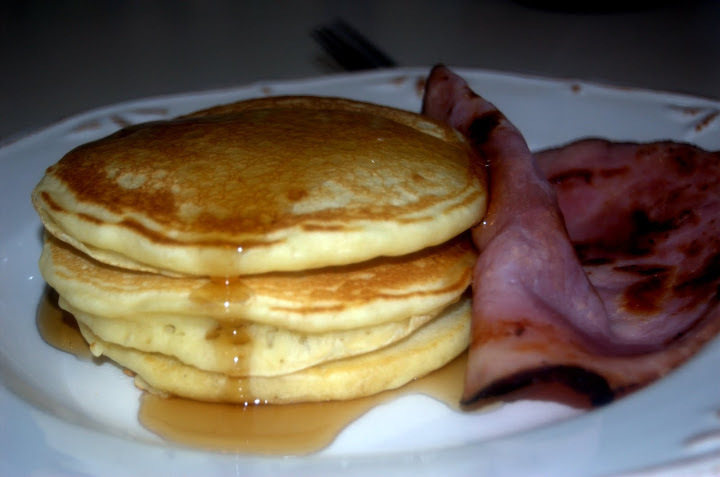 This entry was posted in General Musings and tagged pancakes on February 28, 2010 by Lauren.